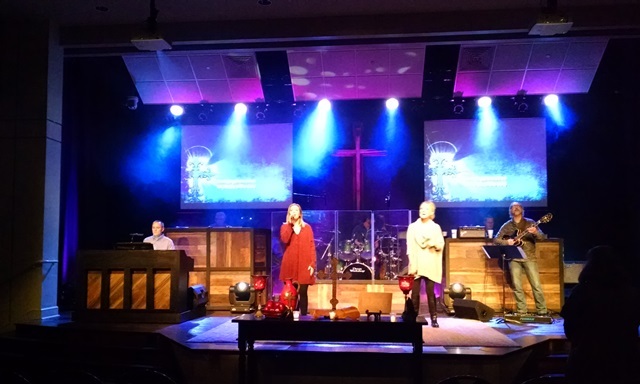 Wednesday 1:00 pm – Service at Lee’s Chapel United Methodist Church on Pine Mountain. Visitation one hour before service. In lieu of flowers the family requests donations to Lee’s Chapel United Methodist Church. We appreciate the calls, cards, emails, prayers and every other demonstration of your love and care for Juno and our family. We have big holes in our hearts, but with God’s help are filling them with wonderful memories and thankfulness for 94 wonderful years. Max’s mother, Juno Armstrong, is now enjoying exploring heaven with Anne’s mom. She entered the gates this afternoon from a hospital in Birmingham. 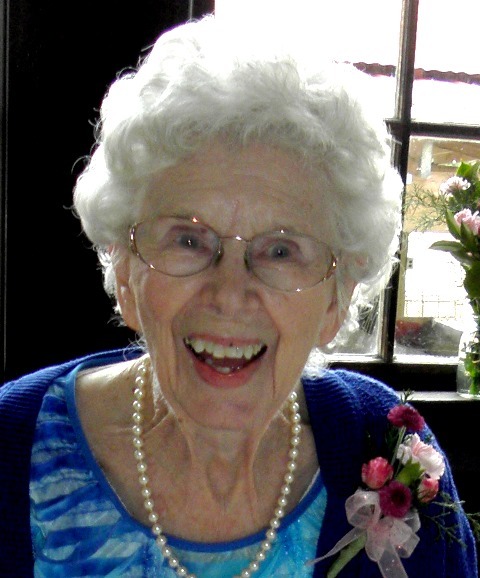 She was 94 and a precious lady who will be missed by all who knew her. We have another huge hole in our hearts today. We will try to post the arrangements after they are made tomorrow. Otherwise the blog may once again be silent for a few days. Please remember us in your prayers. We are going to have to learn how to live in this crazy world without our Moms. Quick blog note tonight. Max’s mom, Juno, is in the hospital in critical condition. We left Crystal River after eating lunch today and are currently in Troy, Alabama. Hope we get a few hours rest and then will head on to Birmingham to the hospital. We would appreciate your prayers. Such a blessing to have another gorgeous day in Crystal River. Don’t know our official high today but the truck display indicated 82 this afternoon. It was definitely another t-shirt day. Feeling very blessed during this time to have sunshine rather than the gray dreary skies others are having this winter. It just makes us feel better. Ruth and Mike brought us our devotion today. It was a good time of sharing where we shared some of our favorite verses of scripture. With Ash Wednesday approaching Ruth also shared some 2017 suggestions from Pope Francis that we might all want to consider during lent. Do you want to fast this Lent? Certainly somethings we could all consider. Thanks for sharing this Ruth. Then after reviewing our prayer list and joining in prayer we all went back to work. Max, Lou and Rod headed back to the hurricane house which is located about 30 minutes away in Homosassa, FL. 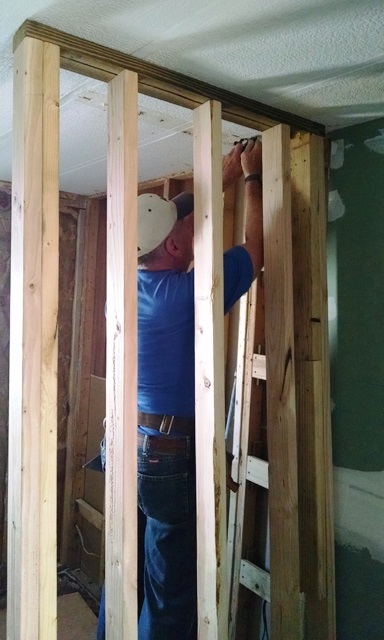 Max and Rod finished framing out the walls in the bathroom, reinstalled the light and then began on the plumbing. 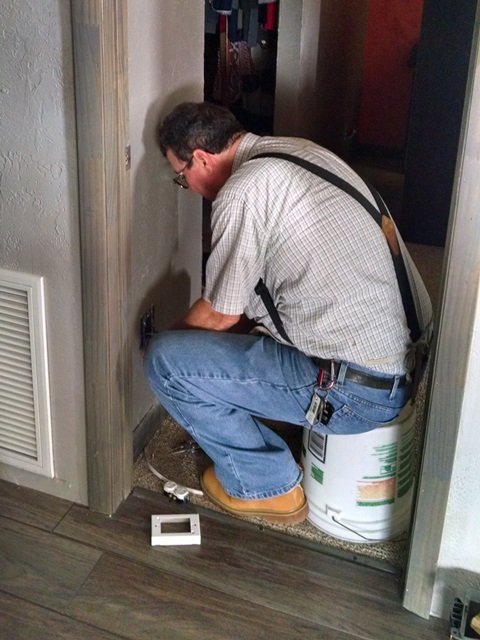 Lou continued to trace down electrical problems and reinstall more outlets. Good progress was made in the house today. 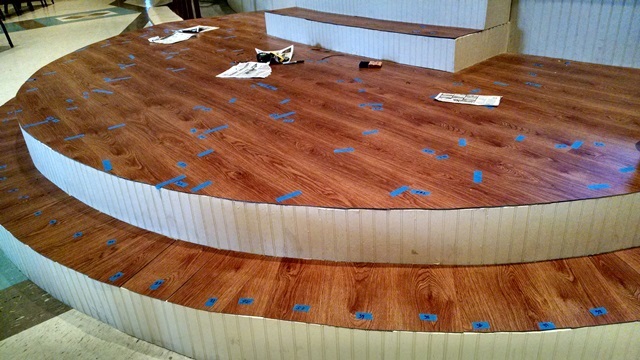 Ruth was back to painting trim for the sanctuary and Karen and Janie began the installation of the vinyl on the stage. The ladies are making the sanctuary look nice. Bob and Mike continued to work on moving some accordion room dividers to another room. This has turned in to quite a project since the divider is very big. 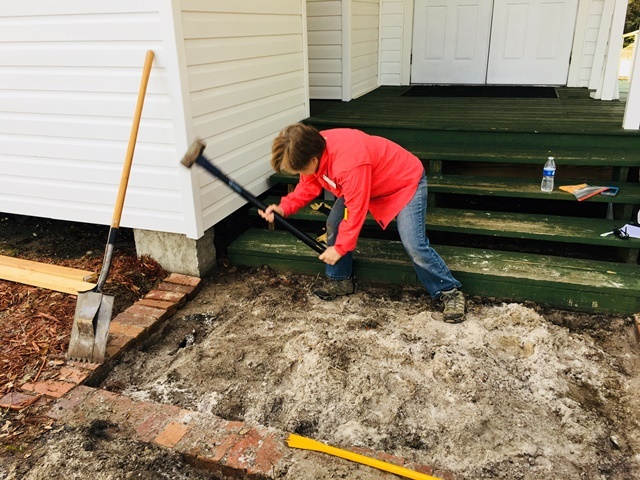 Anne, Carol, Elaine and Joanne returned to the wall project for a little recheck and then moved over to the chapel to work on removing brick and forming up for a concrete pad at the base of the steps. What everyone thought was going to be a really quick project turned into a lot more. 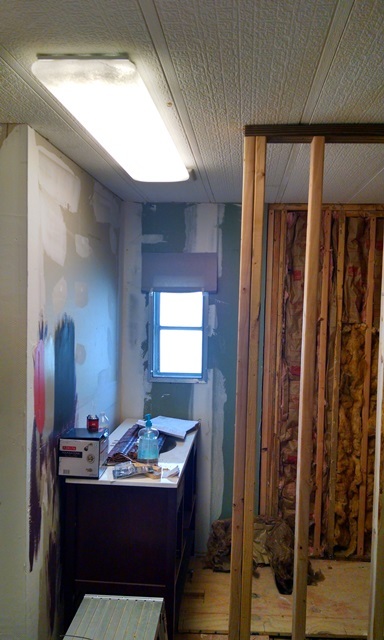 All the interior brick were bedded down in sand and were easily removed. Then it was discovered the border bricks were actually two bricks high, on a concrete footing, and set in concrete. The ladies had to bring out the sledge hammer and the electric chisel. It was decided to leave the very outside border. That project will be continued tomorrow. It was a productive day. 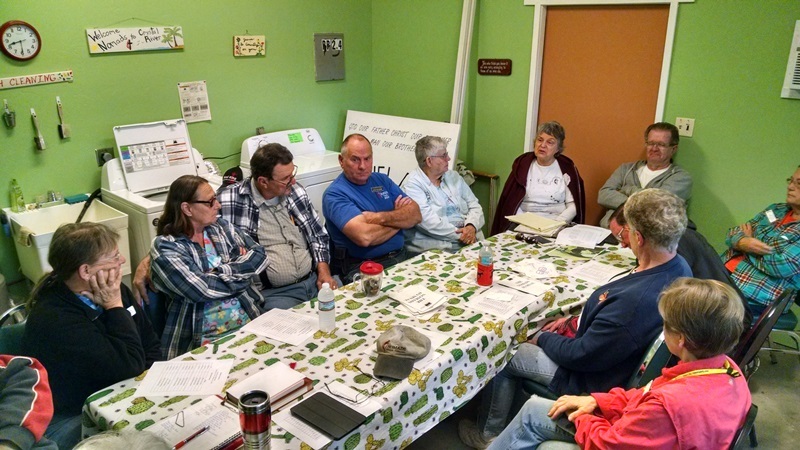 This is a really good team and we have really appreciated their support and concern for us. Hope you are having a good week. Today was a perfect winter day in Florida. It was a little cool and cloudy first thing this morning and by 9:00 it was beautiful. It was really nice to have a day like this. Helped our spirits. Of course we started our day with devotion by Andy using Jesus Calling and his wife Connie talking about the Towel and Basin Society. Andy reminded us that if we will seek God’s face we will receive peace. A message we need to remember right now. We then received our work assignments. 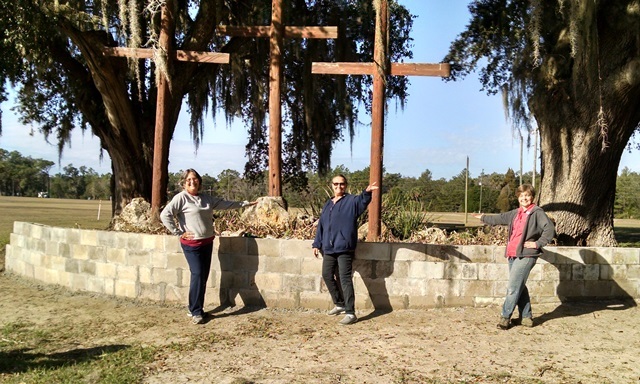 Anne, Carol and Joanne went to the outside chapel to work on the retaining wall. They plan to fill the concrete block cells with concrete but some of the “reclaimed” blocks needed some patches so the concrete wouldn’t flow out through the unwanted holes. The outside chapel has three crosses and some nice seating. We understand it us used for Easter sunrise services and by the youth at various times. It’s the kind of place we like. Quiet, outside place good for meditation and reflection. 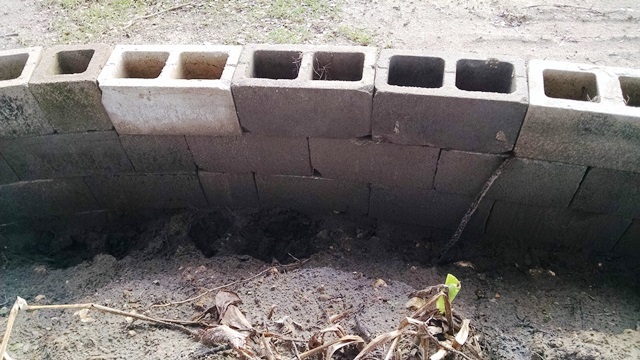 We mixed up some mortar and filled the damaged areas of the block and some exceedingly wide gaps between blocks. We finished that project late this afternoon. We may have some more work to do on the landscaping around the chapel but don’t know if that is next on the list. 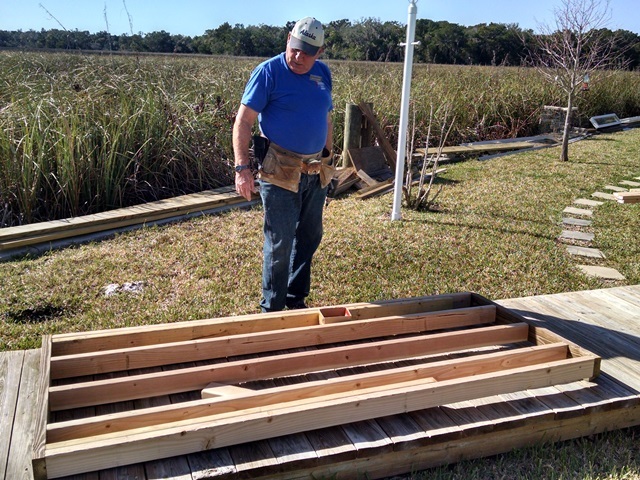 Max worked on the community service side in a home damaged by the hurricane. 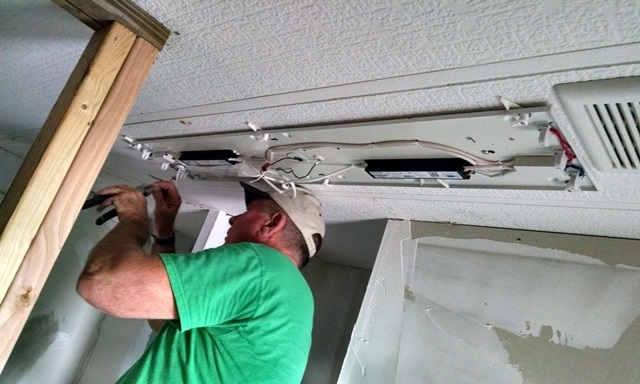 He installed a light fixture and worked on remodeling a bathroom and troubleshooting some electrical problems with Lou and Rod. Mike and Bob completed the outside steps and railing at that location this morning. Ruth painted trim for the sanctuary. Elaine worked in the Thrift Shop this morning but came outside and helped us in the chapel for a while this afternoon. 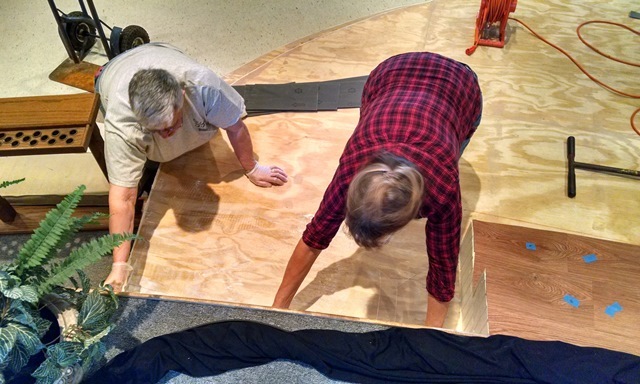 Janie and Karen have been working on new flooring for part of the stage area, and enlarging the steps to the stage. 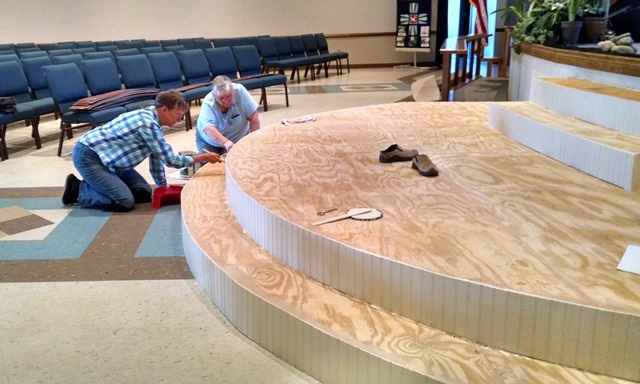 They have made good progress and plan to start gluing down the flooring tomorrow. The church is feeding us lunch everyday. We had some good chicken and rice and black beans today, along with some sub sandwiches and cookies for dessert. We will have to be careful or this will be another five pound project. This morning was very cloudy and by church at 10:30 it was raining. It has rained the rest of the day. Part of the afternoon it rained so hard we had to turn the surround sound up louder than usual to watch our movies. Love to sleep to the rain on the roof but it was a little noisy while watching movies. 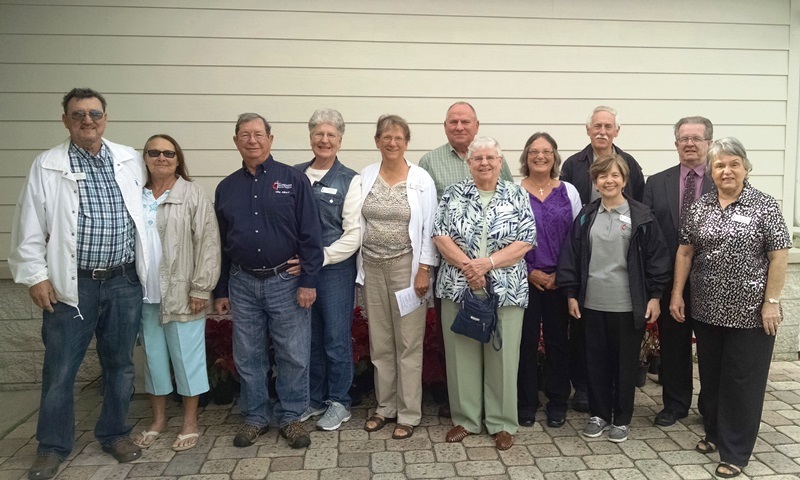 We went to Crystal River UMC contemporary service today. Several of the team members commented that it was a little funny when we looked up on stage and the contemporary band members were all about our age. However, the music was quite good. The entire service was good. The pastor was not here today because of a death in his family but the retired pastor who filled in brought us a good message on Elijah. The church is in the mist of a series “The Elijah Chronicles.” Today’s text was I Kings 18:42-44, with the message titled “What Makes A Prayer.” Per scripture, Elijah was a person just like us, who earnestly prayed. The prayer of a righteous person is powerful and effective. Glad we could be a part of the service. After worship some of us went to Denny’s for brunch. Another good time and another good meal. 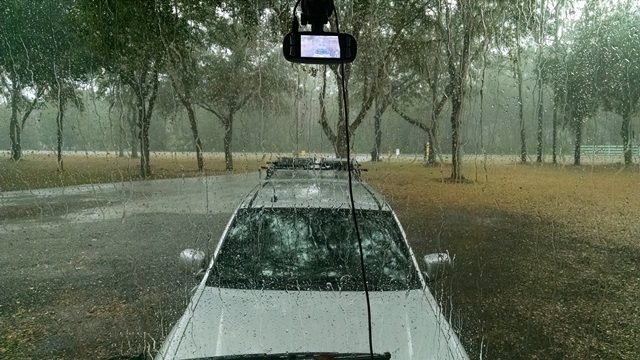 This afternoon was quiet and since we don’t have much of a satellite signal we watched recorded movies. It was a good time of rest although sad too, since we always talked to Mama Ruby on Sunday afternoons. Tomorrow we will start our work week. Since we missed the first week of the project we really don’t know much about what everybody has been doing or what we will be doing tomorrow. 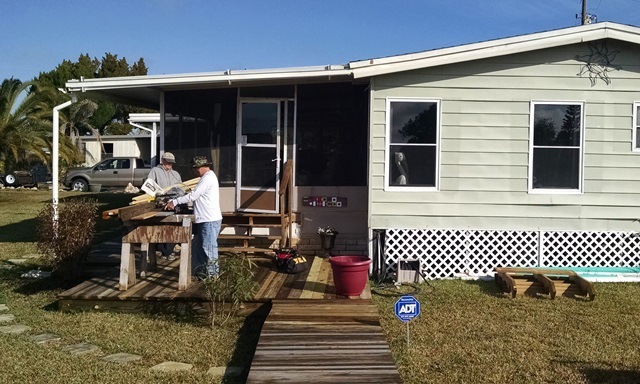 We know some have been working on a home that was damaged by the hurricane, some installing some laminate flooring and some removing a wall. We will see what our assignment is in the morning. “Semper Gumby”, always flexible. Hope you have a great week! Goodness! It is nice to be back in Florida with the warmer temperatures and nice sunshine. The low last night was 52 and the high today about 65. It is so much nicer than the 31-32 degree lows we were having in Tuscaloosa. Of course tomorrow is suppose to be rain but guess that means we can get a nice Sunday afternoon nap. We shall see. We both slept better last night. Really, the first good night of sleep since Mama Ruby’s death. And there were no 4:00 am trains like in Tuscaloosa. You know when living there we never heard those trains, but we sure did this time. So today we slept in and started the day slowly. About mid-morning we went for a walk around the church campus to see if anything had changed. We noticed a few things but not too much. We didn’t see much in the way of hurricane damage at the church or the RV park. After our walk we did the remainder of our setup chores such as tire covers and outside rug. It was almost dark when we got parked last night so we did just the minimal and finished up this morning. After that we ran some errands, went to the grocery store and drove around town a little to re-familiarize ourselves with the area. 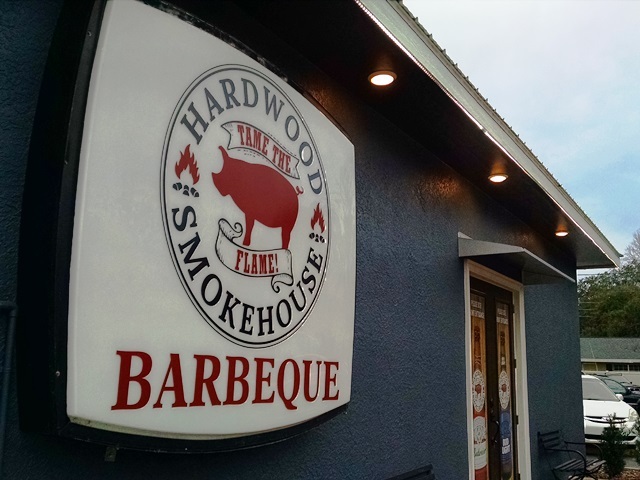 This afternoon some former NOMADS came over to visit with some of our team members and then we all went to dinner together at Hardwood Smokehouse. It’s a bar-b-que restaurant and we had a sampler platter with brisket, pulled pork and ribs all of which were very good. Really good food! And we have enough leftovers for lunch tomorrow. We said we would catch you up on some of last week. Of course, the first few days are still too painful to talk about much, but Anne and her brothers tried to assure that Mama Ruby’s Celebration of Life was all that she had wanted and requested. There were a lot of friends and a lot of family and things got a little crazy at times. Wood Manor was full with no more room at the inn and a lot of the family had to stay in hotels. 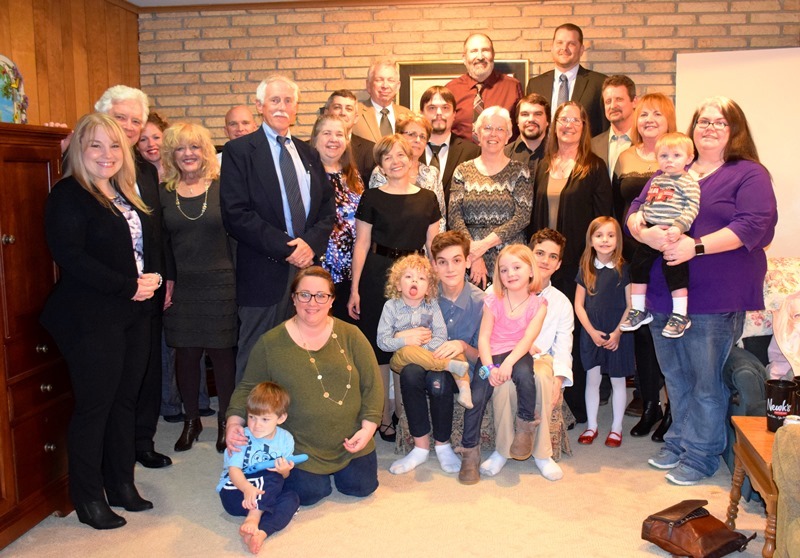 However, most of the family gathered back at Wood Manor after the service Saturday. Mom’s church furnished food and we all spent the afternoon and well into the evening sharing good memories of Mama Ruby and good family times. We have been very blessed to be apart of a wonderful family. Sunday morning we went to First Methodist for church and even though it wasn’t “our” church, it did feel good to be there. By early afternoon all the family had departed and we started the cleanup process. 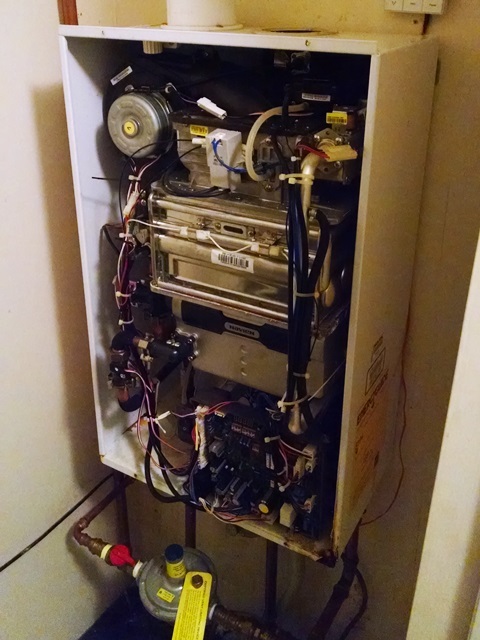 Unfortunately, the water heater went out. We have a 30 amp connection at Wood Manor but not sewer so we shower in the house. So no hot water heater means no hot showers, and since Mama Ruby’s house has hydronic heating, no heat for the house. So, no washing all the linens, towels, and cleaning until we got the water heater repaired. Sonny ordered the needed part Monday and Max and Sonny got the water heater working again Tuesday night. Wednesday and Thursday were spend doing laundry and cleaning. Since we couldn’t do much at Wood Manor on Monday we drove to Trussville and Pine Mountain to visit our other three LOLs. As a result of the 2011 tornado, Tuscaloosa put in a greenway with a walking trail that starts about two blocks from Mama Ruby’s house. We walked the greenway at least once everyday the weather allowed. It just so happens that the path leads to a Cookout restaurant on 15th Street. Nasty traffic but oh so good milkshakes. After discovering the milkshakes we made two trips everyday, once for a milkshake and again to walk off some calories. So that is a brief synopsis of a very long and at times, very painful week. It was also a very precious time of remembering. Time and God will soothe the pain and we will be left with the memories. Remember to be in prayer for services tomorrow. Pray for our pastors and for our hearts to receive what God has for us.